When building up my collection, the hardest thing for me was trying to figure out what I already have! When put under pressure in shop thinking “Shall I get it? It looks familiar, but what if I leave it and I don’t have it?” I’d end up just buying it and then go home to find that I have it about 3 or 4 times. That’s the worst! I’m keeping tabs on my collection as the GWR (Guinness World Record’s) would – any set counts as ONE individual item, and if you have it more than once, it still only counts as one item. In total I probably have over 1000 items – because I have them twice or more. I tend to keep everything in it’s box or packaging and then open anything I have twice. To document everything I have I take photos of it and have a whole OneDrive account dedicated to it. I upload the photos and give them a brief description, so that when I find myself looking for a new Superman mug, I can search for it and see the images of the selection of mugs I already have. But when your searching for comics, it gets tricky. I’d say 60% of my collection are comic books or graphic novels and it is so hard to remember the covers and issues…Until now. 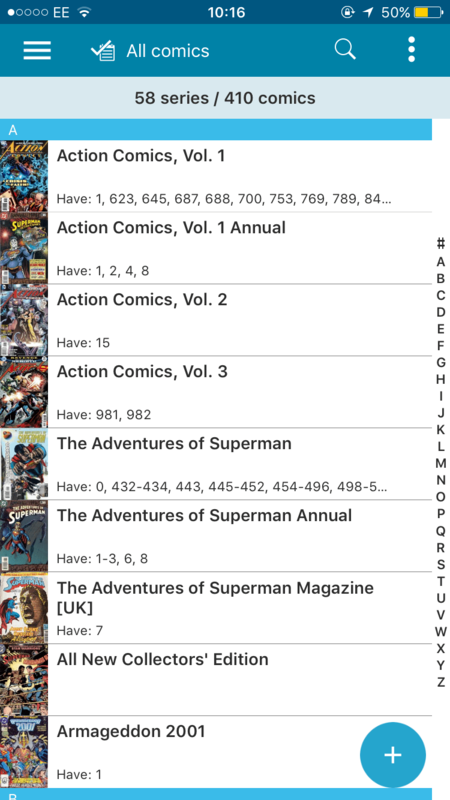 I saw a post on Instagram from a fellow Superman fan about an app that allows your to sort your comics and graphic novels – CLZ Comics. There is a free option, so you can get a feel of what it does and decide if it works for you, but you are limited to adding 100 comics to the database (and if your anything like me… that just isn’t enough!). You basically create an account for a database, where you can also sign into online from any device, not just the app, which is always good! You do still get full usage of the app itself, you are just limited to the number of comics in your database. Then for those die hard comic collections – like moi – there is the paid version of the app. This is a one off payment of £14.99, and hell its worth it! You have an unlimited number of entries to the database, so you can continue to collect….forever. After sifting through and adding my comic collection to the database, I found I had over 20-30 duplicate comics. And now whenever I’m buying comics – in a comic store, on eBay, carboot, wherever, I can search for the comic or scan the barcode in and it will basically tell me whether I have it or not. Not only that but it will also tell me how many series of comics I have, for example; Superman Vol 1, Superman Vol 2, The Adventures of Superman, etc. 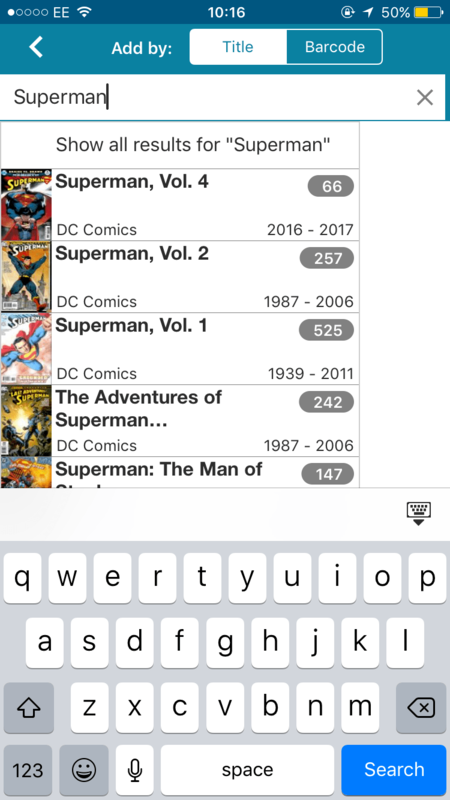 Below are a few screenshots of the app itself and how you go about adding the comics and series to the database. This is what your database will look like, you can also change the colours – I think the default is black, but I like the blue. It will automatically break it down by series in A-Z order, but you can change the way that looks if you click the three dots on the top right corner. To add a comic, click the plus symbol in the bottom right corner, see step 2. 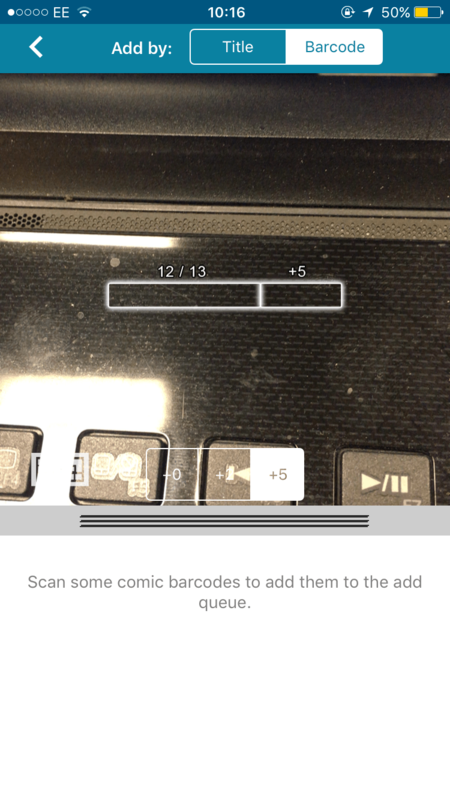 As mentioned you can also scan the barcode of a comic to add it to your database. This works really well, unless for whatever reason there isn’t a barcode or there is a sticker over it. I’ve also found that some barcodes work for different comics, so I’d be scanning one comic and a different one would be added to the database. So when using this be sure to double check your entries, I tend to stick to the title search where I can. Also barcode designs can be different, you will see the (+5), (+0) and (+2), this is basically asking you how many numbers are at the end of the barcode. When it recognises the barcode it will turn red. When adding by title you can enter bits of information, it doesn’t have to be the whole comic title – which is always handy – you can enter the first word, superhero name etc. Then click whichever one you need. There have been a few that I haven’t found, so try a few different variations and if you can’t find it that way, you can always add a new entry which may help others in the future when they are trying to find their own comics. 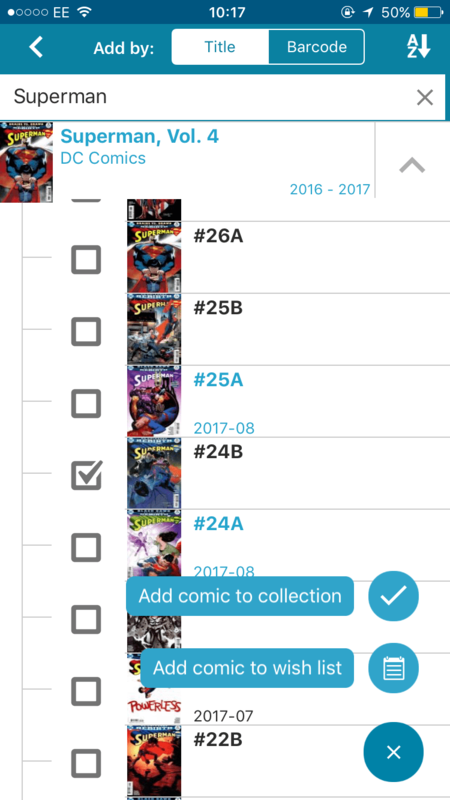 Once you’ve found the comic series, click it and it will bring up all of the issue numbers, find the one your after and tick the box. You can either do it individually by clicking the title or add multiples so if have issue 2, 3 and 4 you can tick those and then select add to collection. Or you can add it to your wish list, I haven’t used this feature too much at the moment, but I’m sure it will come in handy for some people. I’ve found some comics with no issue numbers on, so the picture in the icons are a lifesaver! And wallah! Just for reference the black comic listings are those that aren’t in your collection and those in blue are the comics you have. Let me know if you use this app, any features I’m missing out on, or what you think about it. Share to save a geek’s life. This is amazing.. never knew how much effort and work goes into it. Thank you for the insight. In full detail, Why do you think Batman fanatics are always so critical of Superman and love calling him a lame/Boy Scout and unrealistically good????? Honestly, I think they are just sticking up for their favourite hero. When people diss Superman to me, I get critical of all of the other superheroes, so I think it’s partially that. I think they are so critical because they are almost polar opposites. Batman has no superpowers and is human, Superman has unbelivable powers and is pretty much a god. Superman is a do-gooder whereas Batman is a LOT more shady than that. DC Comics, especially recently shows Batman as their “cool” hero, whereas Superman is morally right one, almost like you’re back at school, the do gooders are usually criticized much more than the “cool” ones. I also think it’s because Superman is unrealistically good – compared to real people in world today, but that what makes me love him even more. As a Superman fan I am usually critical of Batman, I like him, but he isn’t a scratch on Superman. This is an awesome response thanks for the REPLY BACK!!!! Imagine THIS… if D.C. Took a risk (I know this has been done before in comics) and made BATMAN the Bad Guy for BatmanVSuperman? You would have had a truer and more pure GoodVSBad dynamic… think about it… Batman turns corrupt in a criminal enterprise…in Gotham.. it’s a big story…Lois goes to Gotham ….to do story…bad things happen…SUPERMAN & Batman and his goons have a square off , they use their weaponry to temporarily stop Superman but he reigns victorious in dark and gloomy Gotham … that would have revived the SUPERMAN movie franchise better! I don’t think this story line would have corrupted the Batman franchise… Batman HAS to be the Bad guy…where as Superman is Apple Pie!!! A true God… we need scenes where Superman is bending iron and hyper speed💨💨💨wrapping it around Batman’s shoulders or Batman activating the side mirror shotgun side mirrors on Batmobile and bullets bouncing OFF Superman UNBOTHERED!!! What u think? Superman means so much to me and has got me thru the rough patches of my life !!!!! Next Post How Yoga got me out of my exercise rut.